While thinking about Jeff’s post on the fastballs of over 100 miles per hour, I thought it might be informative to look at the pitchers who have pitched their fastballs the slowest this year. No, it’s not as flashy as those who live at the top of what’s humanly possible, but it makes for an interesting contrast. What’s more, you’ll often hear broadcasters say something along the lines of “you don’t need to throw 100 if you can locate your fastball.” Is that true for pitchers who aren’t anywhere near 100? At first blush, it seems like a pretty good list, what with two Cy Young awards and ten 15-win seasons among those three gentlemen. As we all know, though, these three aren’t what they used to be, and the low velocities are likely a big part of the reason why. 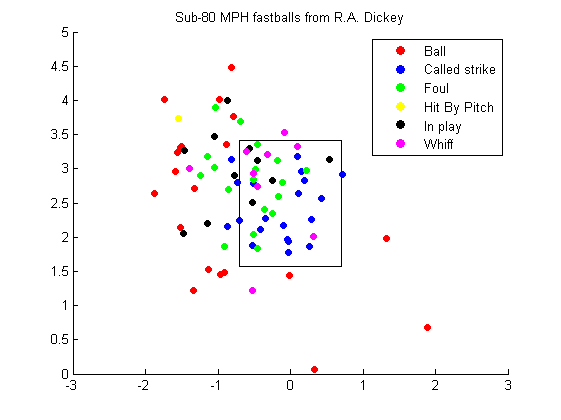 R.A. Dickey is clearly the outlier here, of course. The fastball is more of a surprise pitch for him, so you would expect a lower number for the contact rate and in-play rates than the others, small sample sizes be damned. Of note: his contact rate and in-play rate on his slowest fastballs are lower than the contact rate and in-play rate of Bruce Rondon’s 100+ MPH fastballs (81% and 51%, respectively). Of further note: “Hey, Dickey should throw that fastball more often!” is exactly the exact wrong reaction to learning the above factoid. 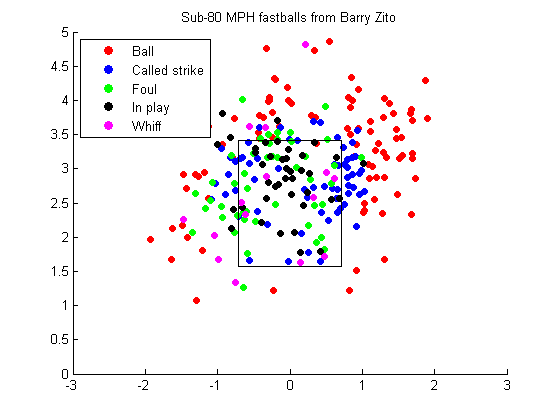 I don’t know about you, but I for one am surprised to see the success (relatively speaking) Zito is having with his slowest fastball by elevating it. 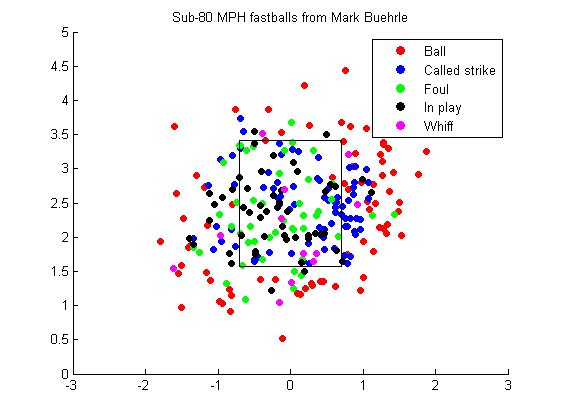 He has a better swinging strike rate and in-play rate than Buehrle, whose slowest fastballs are all over the map, and he’s not exactly doing it by painting the zone down and away. Does Dickey love to live in the right-hand batter’s box or what? Not only is he throwing a lot of slow fastballs in there, but he’s getting more swings and misses than I would have guessed for pitches that are a foot off the plate. My best guess is that hitters are just so happy to see something straight that they can’t resist swinging. I know what you’re all thinking: who swung (and missed) at a 78 MPH fastball from Barry Zito that was nearly five feet off the ground? Take a bow, Troy Tulowitzki. I don’t know if we can draw any conclusions from this, except that to succeed with an extremely slow fastball, it’s better if your primary pitch is a knuckler. If you simply want to have a job with a slow fastball, it appears to help if you’re a durable veteran left-handed pitcher. We hoped you liked reading On Slow Fastballs by The Kudzu Kid! I have noticed that a particular profile exists for LHPs who get swings and misses on high fastballs thrown at below average velocity. (I’m including the less extreme low velocities, like mid-80’s, rather than the harder-to-find sub-80 mph). Perhaps the swings and misses are just more noticeable because you are left wondering why the pitcher doesn’t get murdered throwing those pitches. My guess is that the high, low velocity pitch is just so tantalizing for the batter that he is coaxed into swinging at a pitch that is just a bit too high to make consistent contact.